Travel back in time to the Nebraska prairies of the 1880s with Willa Cather, the author of this famous classic. She was there. She heard the wind moan over the red-grass praires, the howl of the coyotes, and the clanging of the windmill in the night. Jim Burden, the narrator of the novel, encounters a Bohemian girl, Antonia, who makes an impact on his soul. Observing her struggles in the new land, he is amazed by how she overcomes the obstacles, trials, and tribulations of life. One reader said, "I couldn't put it down until I finished it. Another reader said that she had read it years ago, and "its poignant moments linger with me. 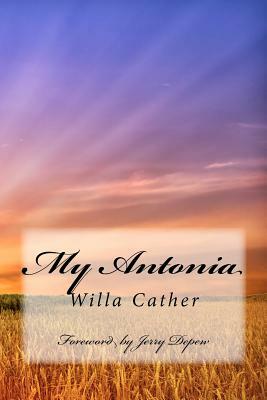 Willa Cather was an American author of many great novels. She won the Pulitzer Prize for "One of her Own," but many believe that her best novel was "My Antonia." She and her parents moved to a farm near Red Cloud, Nebraska in the 1880s. Later they would move into the town of Red Cloud. Many of the characters in her novels were based on people from this small town. In "My Antonia," the town was called Blackhawk. The Willa Cather Foundation has restored the home of her childhood, and many thousands of people visit her former home each year. It is like taking a visit back into time because many of the books of her childhood and many of the things of her parents and grandmother are there. Cather is best known for the trilogy novels about Nebraska pioneers--"O Pioneers," "The Song of the Lark," and "My Antonia."